It's been three months since everyone under the age of fifteen became trapped in the bubble known as the FAYZ. Things have only gotten worse. Food is running out, and each day more kids are developing supernatural abilities. Soon tension rises between those with powers and those without, and when an unspeakable tragedy occurs, chaos erupts. It's the normals against the mutants, and the battle promises to turn bloody. But something more dangerous lurks. A sinister creature known as the Darkness has begun to call to the survivors in the FAYZ. It needs their powers to sustain its own. When the Darkness calls, someone will answer -- with deadly results. 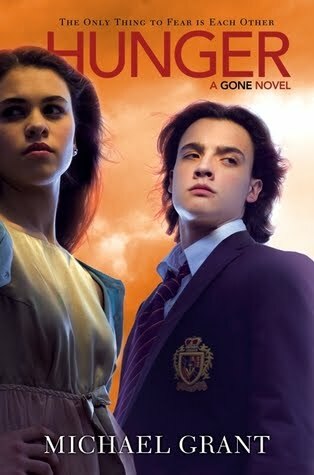 I recently read the first book in this series, Gone, and was instantly propelled into the story. The same thing happened to me once I started Hunger. All of your favorite characters from book one are back, including - Sam, Astrid, Edilio, Quinn, Lana, Albert, Cookie, Brianna, Dekka, Jack, Little Pete and Orc. Also back for round two are those characters you love to hate, Caine, Drake and Diana. This time around Sam and his gang are dealing with a constant wave of problems - they are still dealing with Caine, but they now have to face off against the ever creepy "darkness". The town, in which Sam acts as mayor/father, is also dividing and everyone is taking sides - the Freaks vs. the normals. In short there is a lot going on in this book. Now, normally, this isn't an issue for a book containing nearly 600 pages, but this did pose a problem for Hunger. It is the exact same problem I had with book one, there are just to many to many different point-of-views. The book is constantly switching narratives, and the reader has to follow about twenty different stories. Granted, all the stories tie together, but I feel like it takes away from the book. Not only do you follow all of the characters I mentioned above (a total of 15), but there are also new characters added into the mix. You spend time, Hunter, Duck, Zil, Orsay and Brittany, who are all new to the book. There are also more minor characters that made appearances in book one, like Mary, Howar and John who also do some narrating.With all of these different narrators, I found myself drifting from the plot. I just simply stopped caring about things that didn't directly concern my favorites, Astrid, Sam and Edilio. However, all the narration problems aside, I really enjoyed this book. Once again, there is plenty of excitement packed into the pages and tons of terrifying drama. Kids are pushed to their limits by their hunger and you see a lot of people snapping. There is also plenty of interaction between Astrid and Sam, who are quickly becoming one of my favorite lit couples. They play off each other brilliantly, and Grant does an amazing job keeping their relationship realistic. All in all, like Gone, when Hunger is good, its great. Due to an overwhelming amount of narrators, the pacing is sometimes slow, but if you stick it out, you will not be disappointed. Its an action packed book with plenty of excitement and plot twists to keep you turning the pages. I did not enjoy it quite as much as Gone, but it was still a great read! I really love this series, but I get what you mean about the switching view points. Except I had a different problem, I didn't want to hear about Sam and Astrid (I find them to be a bit boring) but about Diana and Caine because their relationship is so fascinating. I highly recommend the series, especially Hunger which I feel is the best installment.